The Boston Globe is urging Gov. Deval Patrick to pick Michael Dukakis to fill Kennedy's seat until January. (CNN) - The Massachusetts Senate approved a bill Tuesday that would allow the state's governor to appoint an interim replacement to hold the late Sen. Ted Kennedy's seat until a special election is held in January. The measure, which won the approval of the Massachusetts House last week, is heavily backed by White House officials, who want to ensure Democrats have 60 votes in the Senate - the necessary number to stave off a Republican-led filibuster - when the chamber takes up a health care reform bill later this fall. The bill, which passed on a 24-16 vote, must now be voted on again by both chambers as a procedural matter before reaching Democratic Gov. Deval Patrick's desk. Patrick, a longtime Obama ally, has said he will sign the measure and will move quickly to fill the vacancy. In an editorial Tuesday, the Boston Globe urged Patrick tap former Massachusetts governor and Democratic presidential candidate Michael Dukakis for the post. "The ideal candidate for the interim job would have a high profile, significant policy expertise, and a record of political independence – but no further political ambitions," the editorial said. "Dukakis is the most logical choice; indeed, he may be the only one who meets all the relevant criteria." Dukakis, currently a professor at Northeastern University in Boston, has repeatedly ducked questions about whether he'd be interested in the four-month-long job. "I'm not going to talk about that," he told the Boston Globe last week. "The one thing that's important is that the bill gets passed." A special election to fill the rest of Kennedy's term is set for January 19, with primaries slated for December 8. Oh give it a rest. Massachusetts law allows this change per Kennedy's request. Geez. This wouldn't being happening people if this was a Republican who held this office. You see, only democrats are above the law and can change the rules for them. No wonder we live in a racist society. All this bill does is ensure that MA has full representation in the United States Senate. It does not prevent a Republican from being appointed nor does it require that a Democract gets picked. The Bill pushed through makes MA Law more efficient. Despite your partisan outlook, this is ultimately better for the people of MA. And this person might be in office for 3 months top with the Christmas break. How can someone who has never been a Senator do anything in that amount of time to help MA? Why would anyone want to work with a temporary person and how much clout could they bring to get anything passed to benefit MA? Health care? MA already has universal health care, that Kennedy helped write. "All this bill does is ensure that MA has full representation in the United States Senate"
OK then shouldn't W. Virginia also complain since Robert Byrd is MIA all the time? What about Illinois when Barack Obama voted present over a hundred times? Are/were those constituents getting their full representation? For Republicans...It's Called Karma! For Republicans...It's Called The Four Horseman Riding Into Town. And For The Republicans...It's The New World Order Put Into Place. All Signaling The End Of The Republicans As We Know It. The law was changed to allow the people to vote in the replacement in a special election not a Governor appointment for the rest of the term. The current bill passed was suggested by (R) and the dems turned it down and now they want to change it when it suits them. There also was a part of the bill shot down that said the person had to be from the same party because it was UNCONSTITUITONAL. It shouldnt matter what party was in office, it should matter who the person is. 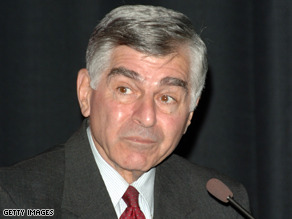 Governor Dukakis is a great choice to fill Senator Kennedys seat.